Our coop kids loved our first Middle Ages read aloud – the younger ones, particularly, were intrigued by The Whipping Boy: the exciting story of “Prince Brat” and Jemmy, the young boy that received the Prince’s well-earned spankings since it was against the law to spank the royal heir. What kid wouldn’t love the idea of doing whatever he wanted with someone else to take his punishment? Better yet, while they were reading about the antics of the self-centered prince, they were learning about Middle Ages/Renaissance life in a castle, highwaymen, the town fair (complete with a dancing bear) and much more. Our curriculum is literature-based and subjects are integrated. Our literature-based curriculum is built around the best of the best of children’s books. We read hundreds of books to suggest those that have the greatest appeal to young readers, are well-written, and often include character lessons. Differently aged siblings also read books appropriate to their reading levels , but pertaining to same unit and topics. Using the books read for history and science, students use simple Charlotte Mason methods to learn grammar at their own levels. We study history chronologically and gently weave in science, language arts and fine arts. a younger one made a lap book with middle ages vocabulary, an illustration of a castle with the parts labeled, and a short dictated summary of The Whipping Boy. One of the hallmark’s of our homeschooling curriculum is that everyone studies the same period at the same time. Often, students complete assignments that are different from the others, but all participate in writing (language arts), learning history, reading (language arts), drawing or clay modeling, and looking at period architecture (fine arts). We also listen to music from the Middle Ages and other time periods as we study them and study art from them as well. Remember that learning increases as you use more than one sense! Again, because these subjects are integrated, children get the chance to become immersed in a culture and time period in a unique and memorable way. School becomes more engaging, more fun. Hence, students remember more of what they studied. Win–win! Trying to teach every subject separately to more than one child is exhausting. And after years of homeschooling, I’m convinced it’s not as effective as a more integrated approach. It’s easier to have your children studying together, as much as possible. So that’s why different levels of our Daily Lesson Plans and Unit Programs all study the same historical periods at the same time. We include history, science (for K-8th grade students), language arts, and fine arts. We do not cover high school science, foreign language, or math at any level. 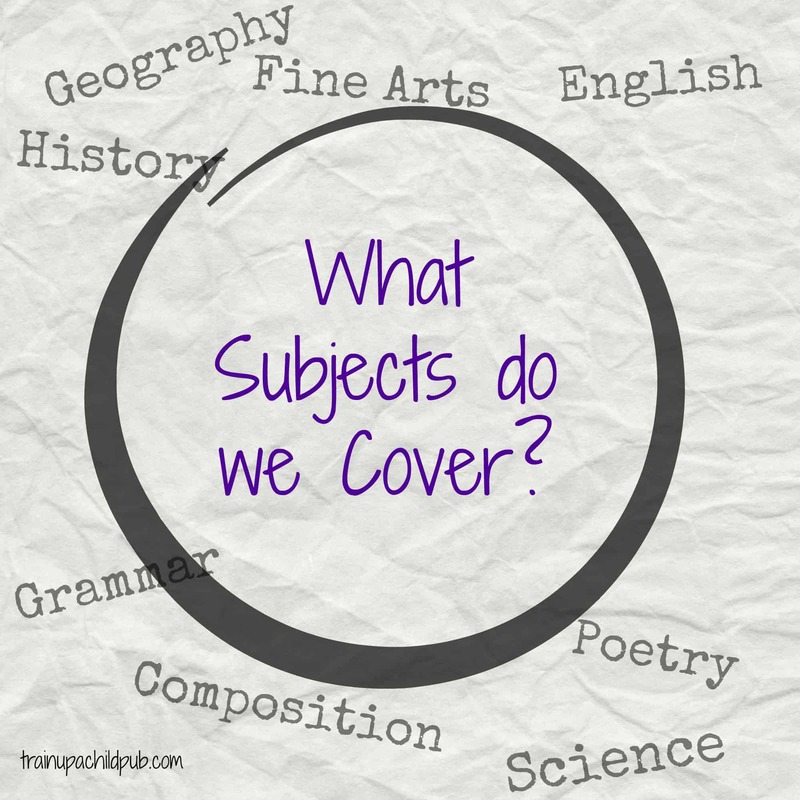 Keep reading for an explanation of how we include these subjects in the curricula. Although we do not cover the Bible as a separate subject, we use the Bible for teaching history and science. Additionally we use it for memory work and as a foundation for everything else we do. Our curriculum often refers to the Bible, particularly during the Ancient and Renaissance and Reformation historical periods. We also cover the days of Creation in science and include Scripture memory work during the Ancients, as well. Additionally, in our unit program manuals we include a three year Bible reading plan and blank prayer log. Especially with your younger children, it’s important to use the real words of the Bible when teaching the subject of history. Actually, we see history as HIS-story. Also in our Christian homeschooling curricula we refer to Biblical events as Bible ‘accounts,’ rather than Bible ‘stories.’ This helps smaller children understand that these events actually happened. In our middle school daily lesson plans, as students mature, we help you teach them about “author’s bias.” Our plans prompt you to guide your middle schoolers to examine what they read, hear and watch… according to biblical standards. When we include memory work or Scripture within our curricula, we have used the NIV ’84 or the ESV. We hope you include the Bible and Scripture memory work in your homeschool, using the translation you are most comfortable with. Our curriculum is written from a Reformed, biblical worldview. Train up a Child Publishing uses whole, living books as recommended by Charlotte Mason to teach reading, history, science, language arts and fine arts. We divide history chronologically into nine periods, and use that as a framework from which to teach the other subjects we cover. Since we aren’t really a unit study (where ALL subjects are centered around a theme), we call our our more unstructured curricula unit “programs” instead of unit studies. Timeline, globe, map, and other geography activities, as well as projects for individuals and groups, are suggested in each historical unit of our Unit Programs and round out the subjects included in our curricula. Our book suggestions are based on the quality of literary value, Biblical relevance, historical correctness and depth, and/or outstanding illustrations. Our literature-based homeschooling curriculum utilizes the best of the best children/young adult literature we can find. One or more of the authors of this homeschooling curriculum has read each book recommended in our programs. We have read literally hundreds and hundreds of books putting together this curricula! To see the history topics covered in our Daily Lesson Plans, view our scope and sequences for each of the grade levels. We include science from kindergarten through eighth grade, but do not include science in our high school programs, since colleges want to see specific courses with labs covering specific topics in a particular way. We leave that to others’ expertise! …all part of daily life during that time period. Wherever possible, the science topics relate to the core history reading. We read nonfiction, science-based books as well as ones that include hands-on experiments, projects and other science-related activities. The books in our programs are suggested because they include strong science concepts, excellent graphics and examples, and/or valuable experiments. Like Charlotte Mason, we encourage parents to spend time outdoors in nature observation as well as inside reading. Nature journals were a big hit with our kids, so we describe in our curriculum how to keep nature journals and encourage you to get outside as often as the weather where you live allows. To read more about the science topics covered in our Daily Lesson Plans, view our scope and sequences for each of the grade levels. Language arts consists of reading, phonics, composition, literature, grammar, poetry, punctuation, vocabulary and spelling. Whew! Copywork and dictation integrate history, literature and science with grammar studies and other language arts. Copywork, reading assignments, narration prompts and discussion questions are provided in our structured Daily Lesson Plans and are taken directly from history and science reading and from Scripture. With our more unstructured Unit Programs, you choose the books you want to read (from our pre-read book suggestions), the copywork, spelling and vocabulary. Our Unit Program Teacher’s Manuals include detailed instructions for you describing how to teach phonics, spelling, grammar, punctuation and handwriting. In addition, spelling, grammar and handwriting checklists are provided to assist parents in selecting copywork to help teach specific English concepts. Writing skills beyond copying begin in third grade. Memorization of poetry and excerpts from literature are also part of the language arts design. We study music and art (painting, drawing, sculpture, architecture) from each time period. In addition to learning about art, this helps students gain a clearer picture of the historical period. Our structured Daily Lesson Plans include regular picture study and music study as well as a look at architectural innovations during the different periods of history. In our daily lesson plans we often provide web links featuring art of a particular time period. If you have a student that shows special ability in the arts, learning history through the lens of this gift really makes it come alive! Using our assignment ideas you can truly customize your high schooler’s learning experience. Our Secondary Unit Program, which covers from 9th through 12th grades, has a few extra sections written to your high school student. Every unit includes a Bible Study/Scripture memory passage, Organizational/Time Management Skills section, and a page of mini-research topics. To help you teach your children together, we also list several Multi-Level projects that could be completed by different-aged siblings or a co-op of students of different ages. Take a look at this sample unit to see these additional features. Do you have any questions about what we cover or how we do it? List them in the comments or email us at infodesk@trainupachildpub.com. We’d love to hear from you! Read more about our Unit Programs here.